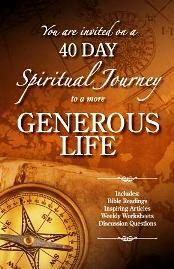 Over 3000 churches have used Brian Kluth's 30 & 40 Day generosity devotionals to IGNITE People's Faith, INSPIRE Generosity, and INCREASE Giving! To help enhance the value of this generosity experience at your church, you can purchase a Digital kit with worship service videos, small group and SS videos, 40 Day devotional APPS for phones and tablets, sermon helps, children's SS curriculum, and so much more! CAPITAL CAMPAIGNS: Churches conducting in-house or consultant-led capital campaigns have found this devotional a great resource to maximize the level of pledges they receive. CUSTOM COVER COPIES: Churches ordering more than 200 copies have the option to CUSTOMIZE the 4 COVER PAGES.